The global art market contracted for the second straight year in 2016, falling to the lowest level since the financial crisis as economic and political volatility weighed on auction sales. Sales of art and antiques dropped 11 percent to $56.6 billion, according to a report released on Wednesday by UBS Group AG and Art Basel. The decline, on top of a 7 percent slide in 2015, wipes out the gains seen in 2013 and 2014, when sales reached an all-time high of $68.2 billion. “It was quite a challenging year for the art market,” Clare McAndrew, founder of Arts Economics that prepared the report, said in a telephone interview. Her outlook for 2017 is cautious, with sellers holding back as economic and geopolitical uncertainty continues in many countries. Buyers, on the other hand, may view art and antiques as “a relative safe haven amidst volatility elsewhere,” increasing prices for the works that appear on the market, according to the report. Some signs point to a brighter outlook. London auctions of Impressionist, modern, postwar and contemporary art bounced back from last year’s doldrums. Christie’s sold $332.8 million of Asian art in New York in a record-setting series of auctions last week. A 13th century Chinese painting depicting six dragons fetched $49 million, the highest price for a Chinese painting sold outside of Asia. It had been estimated at $1.2 million to $1.8 million. Auction sales declined 26 percent to $22.1 billion, according to the report, released to coincide with the opening of Art Basel Hong Kong. Sales of postwar and contemporary works at auction fell 18 percent to $5.6 billion; modern art was down 43 percent at $2.6 billion; the Impressionist category declined 31 percent to $1.3 billion. The high end of the auction market -- where prices for artworks exceed $1 million -- fell 34 percent. Trophies priced at more than $10 million saw the biggest decline, at 53 percent. Industry leaders Sotheby’s and Christie’s lost market share, together accounting for 38 percent of the auction sales, down from 42 percent in 2015. The U.S. remained the leading market, representing 40 percent of all transactions by value. The second-largest market was the U.K., at 21 percent, followed by China, at 20 percent. Sales by dealers and galleries represented 57 percent of the overall market, rising 3 percent to $32.5 billion. The increase was driven by the top end of the segment, as dealers whose volume exceeded $50 million saw a 19 percent uptick in sales. Sales of Old Masters, which includes many Chinese painters, increased 5 percent to $1.4 billion, surpassing Impressionist art. The results benefited from increased business in China and the U.K., where 15 of the top 18 transactions in the category took place. Art fairs generated about $13.3 billion in sales, up 5 percent from 2015, representing 41 percent of total sales by galleries. Online sales increased by 4 percent to $4.9 billion, accounting for 9 percent of the global market. Most sales were below $50,000, according to a survey of 50 companies. *This article first appeared on Bloomberg. *This article originally appeared in The Edge. Below are items featured at our shop from March - April 2017. For further inquiries, please contact May at 018 3867939. Global art sales plunged in 2016 as the number of high-value works sold dropped by half, while China regained its status as the world’s top market, Artprice said in an annual report released Monday. Art auctions worldwide totalled $12.5 billion (11.8 billion euros) last year, down 22 percent from $16.1 billion in 2015, the report said. The world’s biggest database for art prices and sales, working with Chinese partner Artron, attributed the drop to a plunge in the number of works worth more than $10 million each – from 160 in 2015 to 80 last year. “On all continents, sellers are choosing a policy of ‘wait-and-see,'” Artprice CEO Thierry Ehrmann said. Top-dollar auctions last year included that of an Impressionist painting of a haystack by Claude Monet, “Meule”, which went for $81.4 million at Christie’s. A Peter Paul Rubens masterpiece, “Lot and his Daughters”, sold for $58.1 million, also at Christie’s. Contemporary art had its stand-out moments, too. An untitled painting from American painter Jean-Michel Basquiat went to a Japanese collector for $57.3 million. Wassily Kandinsky’s “Rigid and Curved” from 1935 went under the hammer for $23.3 million. But it was China which chalked up the highest total sales and “established itself clearly as the superpower” of the art world, the report said. After five years of dominance, the country lost its title as top art market to the United States in 2015, but a year later was back, recording $4.8 billion in auction sales. That figure represented 38 percent of total world sales, said Artprice, which compiled the data with its partner firm Artron of China. Traditional calligraphy and painting comprised the vast majority of sales in China. The country’s biggest sale in 2016 was a scroll painting of “Five Drunken Kings Return on Horses” by early 14th-century Chinese artist Ren Renfa that went for $45.89 million. But contemporary art sales, too, are becoming frequent in Hong Kong which “has become an unmissable spot on the art market,” Artprice said. Despite the drop in overall value of sales, the global art market witnessed an 11-percent rise in “fine art” transactions, a category that excludes antiques, applied art like pottery, and furniture. “The range of prices under $50,000 shows the strongest progression and currently makes up 96 of the market in the West,” the art database said. In 2016, “the principal objective was to consolidate the core of the market, to the detriment of a new race to reach record prices,” it said. New York City remained the undisputed capital for art auctions, chalking up $3.2 billion in sales, over Beijing’s $2.3 billion and London’s $2.1 billion. 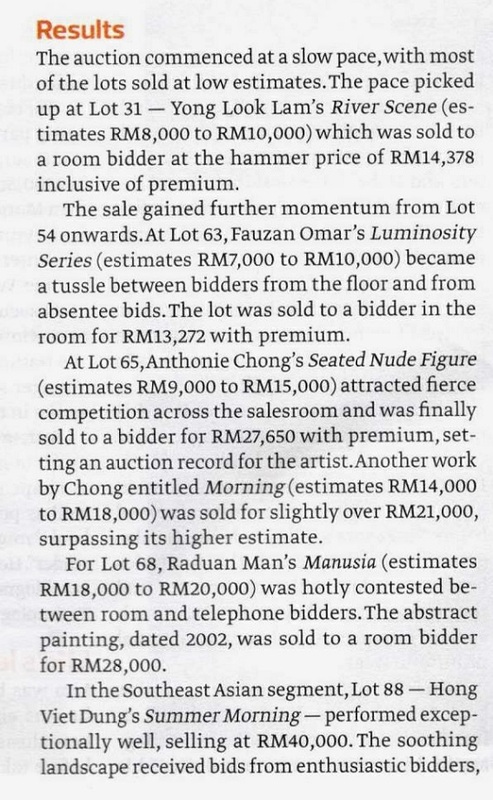 Chinese artists were also the main moneymakers in the auction world, taking three of the five top spots for 2016 sales. This article first appeared on Inquirer.net.